NEW YORK – Coheed and Cambria have revealed the cover and track list for their forthcoming album, The Color Before The Sun (Oct. 9, 300 Entertainment). The cover, which features a serene lake with a house disintegrating into the sky, was created by Nick Steinhardt (Touche Amore, Deafheaven) and reflects the story behind the ten-song album. 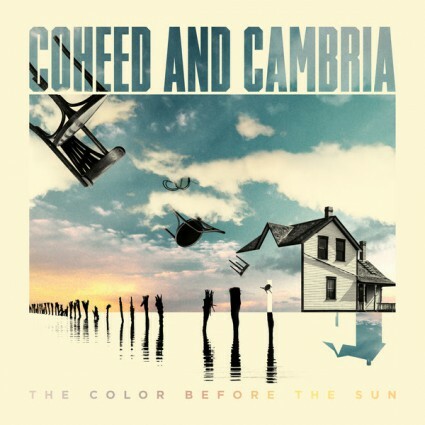 While the most conceptually abstruse Coheed records have always had a foundation in reality, The Color Before The Sun marks the first time Claudio Sanchez is exposing his raw feelings, narrated from his own perspective – the anxiety of fatherhood, the disorienting feeling of losing a home, the reflections had during early morning walks. His own story is told through big, bright, driving, colorful songs that beam like power-pop, crunch like vintage ‘90s emocore and float with the expansive feel of space-rock. Sanchez’s journey is captured not only in the music, but also in a limited edition, deluxe box set available for pre-order as of this morning at www.coheedandcambria.com. The extensive collection offers fans two hardcover books: one featuring album lyrics and expansive artwork from The Color Before The Sun, while a separate book documents the events and emotions of the time with prose and photographs. Four different pieces of music are housed in the die-cut slipcase: The Color Before The Sun (CD), The Color Before The Sun demos (CD), an in-studio DVD and a clear 7-inch with two non-album demo tracks. Purchasers also receive an instant download of “You Got Spirit, Kid,” a membership card, a custom house key, a lapel pin, a certificate of authenticity; as well as exclusive, members-only access to new music, videos, concert tickets, merchandise and commentary from the band. This entry was posted on August 8, 2015 at 10:25 pm and is filed under Hard Rock, Metal, Music, progressive metal, progressive rock, rock music with tags coheed and cambria, metal odyssey, progressive metal, progressive rock. You can follow any responses to this entry through the RSS 2.0 feed. You can leave a response, or trackback from your own site.